A school set up by the entrepreneur Jim McColl for children struggling in mainstream education is to close. Newlands Junior College in Glasgow was set up five years ago and specialised in providing vocational education. About 25 pupils aged between 14 and 16 were studying at the facility in the southside of the city. Efforts are now under way to find places for the students at further education colleges or the city council's own schools. The college was, in effect, an independent school but did not charge fees. A letter sent to parents appeared to blame Glasgow City Council for the closure but the council has strenuously denied this. The letter said the college's "demonstration phase" was coming to an end and it had been advised that Glasgow City Council would not give it the resources to put in on a permanent footing. It also said there was "no possibility" of continued government funding. The letter continued: "We appreciate that this announcement will come as a shock and at short notice. 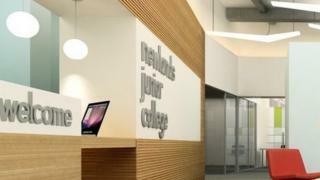 "NJC was set up as a five-year project to prove that a new and innovative approach to education would work. "The project has been amazingly successful with many young people's lives and prospects completely changed. "Right up until this week it was hoped that funding could be obtained to continue the project. "It has become clear today that there is no possibility of continued government funding." A council spokeswoman said: "The sudden closure of Newlands Junior College must be extremely upsetting for the young people and their families. "We are appalled by the way the whole situation has been handled by the Newlands management team. "Letters announcing the closure have been sent out to families out of the blue and without any input from the council." Mr McColl is quoted in a newspaper as saying that the school had a "100% success rate" and had benefited more than 130 people. In 2014, some parents at the school told BBC Scotland of the transformational effect it appeared to be having on their children. However the concept of "an independent school receiving some public money" provoked debate among teachers and education officials. While many recognised how the vocational education on offer was helping the young people, some also questioned the need for Newlands itself. Some within local authority schools were always suspicious the scheme could be a trailblazer for English-style academies and free schools in Scotland - a charge the school always denied. Newlands was not under the control of the council - nor were its staff employed by the council - although it received much of its funding from public money. Its students were pupils from state schools who were not achieving their full potential within a mainstream environment. Sceptics wondered why a similar facility could not simply be run within the normal state school system - perhaps as a unit within one of the council's own secondary schools using teachers employed by the council in the usual way. Some within Glasgow City Council shared these reservations although it agreed to give the school some of its funding for an initial period. It has also received money from the Scottish government. Conservative shadow education secretary Liz Smith has written to Education Secretary John Swinney to intervene in the row. In the letter, she said: "Having seen for myself, on two separate occasions, the outstanding work that was taking place in the college to inspire young people who had felt disengaged from school, l was very persuaded of the role that such an institution can play in Scottish education. "Too often at present in Scotland, we see attempts to diversify the educational experience thwarted, even when that diversification is proving successful." A Scottish government spokesperson said: "The 2018/19 grant award made it clear that the Scottish government would make no further contribution to Newlands College's costs, and we expect the college to work with Glasgow City Council to ensure an orderly transition to provision delivered by the council."